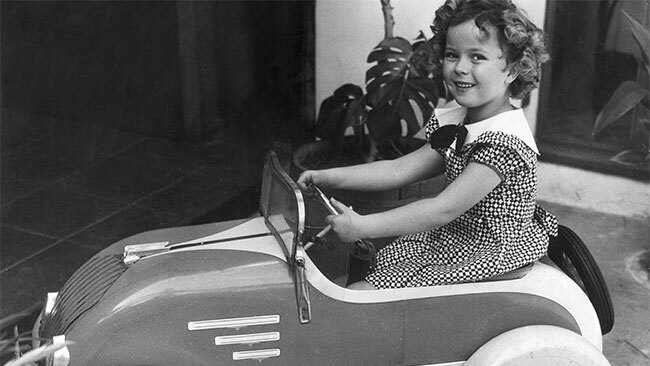 Today is Shirley Temple Black’s 85th birthday. The long-retired star and diplomat is likely quietly marking the day with family at her home in Woodside, California, where she remains largely out of the public eye. Alas, a recently launched Twitter account purporting to be hers was revealed to be a fake after it started pumping spam to 10,000 followers who were eager to find out if Shirley still puts animal crackers in her soup. She was honored by Kennedy Center in 1998, a broadcast worth watching for the revelation that the still-charming actress inspired the famously wooden Henry Kissinger to crack jokes and utter the phrase “On the Good Ship Lollipop” in his heavy German accent. In 2006, the Screen Actors Guild honored her with a Life Achievement Award presented by Jamie Lee Curtis and, in a nice bit of symmetry, Dakota Fanning. Apart from this appearance, she has kept a rather low profile since the death of her second husband in 2005. Although fans worldwide are hoping for a Betty White type comeback, it looks like it isn’t going to happen. Her 85th birthday is significant because her longevity makes her a living link with Hollywood’s classic era. The long-feuding sisters Olivia de Havilland and Joan Fontaine are still among us. 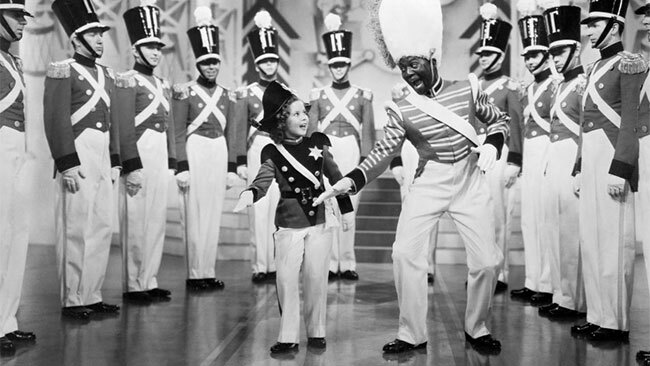 But when they were just starting their careers with small parts in 1935, the child start was getting top billing in the title roles of The Little Colonel and Curly Top. Temple is certainly the last remaining female star of a pre-code film (1934’s Little Miss Marker), making her a bridge to the brief period of 1929-34 when Hollywood still allowed itself to make films that were both glamorous and gritty. The only other true Hollywood star to rival her longevity is Mickey Rooney, who also started as a child performer, but had more lucky with transitioning to teenage and adult roles. Shirley Temple was far and away the greatest child star in the world in her day. She more or less single-handedly save Twentieth Century Fox from financial ruin shortly after she signed with the studio at the age of 5. She was given a bungalow on the Fox lot with built-to-scale furniture and a miniature care. 19 top writers were assigned to crank out Shirley Temple scripts in the race against the onset of puberty. She was the top box-office draw in America four years in a row (1935–38). “During the Depression,” President Franklin Roosevelt said in one of his radio addresses “when the spirit of the people is lower than at any other time, it is a splendid thing that for just 15 cents an American can go to a movie and look at the smiling face of a baby and forget his troubles.” 64 years since she last stepped in front of a movie camera, Fox reports that Shirley Temple still sells one million DVDs a year. A better sales record than some so-called celebs working today, to be sure. Shirley could scoot around her bungalow on the Fox lot, provided she didn’t go too far. Temple will likely always retain the unofficial title of greatest child star that ever was. No one has ever come close to achieving her level of popularity, and no one ever will. Tabloids mean that studio publicity departments can no longer manufacture and protect a young star’s public persona. Much-needed laws now restrict how much time a minor can spend on a set. Even with the double allotment allowed to the Olsen Twins, in our age even a stage mother as devoted as Gertrude Temple was cannot legally provide the necessary training to polish the natural talented need to create another Shirley Temple. Only Temple could sing and dance, cry on cue, and remember not only her own lines but also those of her adult costars. Adolphe Menjou, who had already been in films for a full 20 years before taking second billing to Temple in Little Miss Marker, reportedly said “this kid scares me—she knows all the tricks.” The following year, while filming The Little Colonel Lionel Barrymore forgot a line and his 6-year-old costar fed it to him, sending the veteran actor into a violent rage. Both of the older actors would soon be doing what they could to get on the girl’s good side, much like the gruff characters they played until their hearts are softened by Shirley’s character. 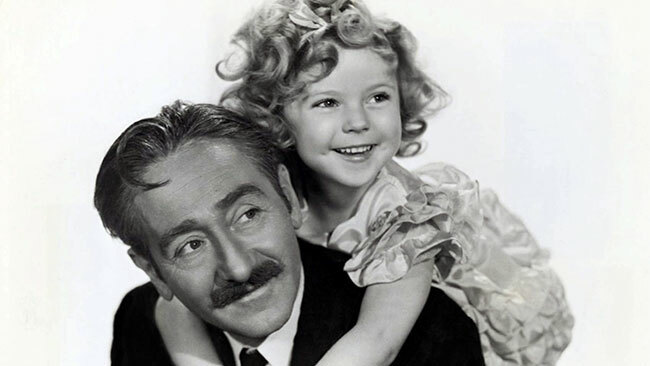 With Adolph Menjou in Little Miss Marker, her first title role. Temple’s boundless popularity is hard to imagine today. In John Huston’s 1982 musical film Annie, the red-haired orphan is granted an audience with FDR (played by Edward Herrmann) who is touched by the girl’s optimism. The scene is likely based on Shirley’s real-life visit to the White House, were both the president and the first lady were fans. The scene make one wish that Fox had developed an adaptation of the Harold Gray comic strip for its young star—Temple was forever playing orphans and the girl with circles for eyes was the ultimate one. On the other side of the Atlantic, Princess Margaret and Princess Elizabeth (the future Queen Mother) were devoted fans. So great and early was her fame in Hollywood, that her first baby tooth had only just fallen out when she was asked to press her tiny hands into the wet cement outside Grauman’s Chinese Theater. There was a dark side to her fame. Among the thousands of fan letters pouring in every week were some addressed to her father, from women pleading with him to sire “another Shirley.” Although Fox hired a retried police officer to act as her chauffeur and bodyguard, she was the target of at least two attempted assassinations. In the most bizarre of the incidents, she was singing “Silent Night” live in the CBS studios at Christmas time, 1939, when a woman in the audience pulled a gun and aimed it at the child star. The would be assassin was dragged out before she had a chance to fire a round. It was later learned that he had a daughter who died the same hour Shirley was born and was convinced the child star had stolen her girl’s soul. “The tale seemed understandable to me,” Temple would write nearly nearly 50 years later in her autobiography Child Star. The feasibility of soul transmigration aside, the woman’s calculations pinpointing her daughter’s passing and Shirley’s birth were off by a full year. Fox had faked a birth certificate to shave a year off of the age of its top star. America’s sweetheart visits the White House. Her parents would reveal her true age to her as she entered her teens, and she shared it with the public when adjusting her age from 20 to 21 during a highly publicized divorce. She was to have a remarkable childhood. 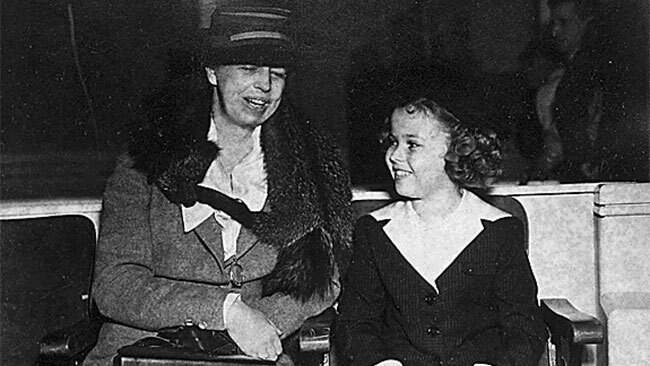 Like many little girls, she idolized Eleanor Roosevelt and Amelia Earhart, but in her case she also got to meet them. But like any other child star, she could not have a normal childhood. Although she had her specially-built bungalow at Fox, she was not allowed to walk around the lot, for fear that too much attention would spoil her. Her playhouse was also her prison. She was also forbidden to do highly lucrative personal appearances, as Fox feared audiences would not want to buy a ticket to see the girl if they had already seen her for free. The other unfortunate footnote of her stardom is that while she made millions for Fox, not much was left for her when her contract with the studio ended. Her father was an investment banker who squandered a good deal on poor investments. Another large chunk was claimed by Uncle Sam. Although her films are still still selling one million DVDs a year, there are passages in the Temple filmography that are cringe-worthy for viewers of today. There certainly some racist overtones in some of her films. The worst offender is certainly the short Kid ‘in’ Africa, which sees little Shirley popped in a stew pot by African cannibals, also played by children. The actress was still too young to comprehend the meaning. When she and Bill “Bojangles” Robinson where preparing to become the first inter-racial dance couple in American film in The Little Colonel, the famed tap dancer arrived at her hotel for rehearsals. She learned that he was staying in the chauffeurs’ quarters over the garage, but later admitted that she wouldn’t understand the reason till years later. Sharing a dance with Bill Robinson. Adult emotions of love and grief glissade across the mask of childhood, a childhood that is only skin-deep. It is clever, but it cannot last. Her admirers–middle-aged men and clergymen–respond to her dubious coquetry, to the sight of her well-shaped and desirable little body, packed with enormous vitality, only because the safety curtain of story and dialogue drops between their intelligence and their desire. Twentieth Century Fox took seriously the need to protect the squeaky-clean image of its top star and sued for libel. Greene fled the controversy to Mexico, which was to change the course of his career. There may have been some dirty old men seated in the darkness of theaters when Temple’s films lit up the screen. Some also appear in her autobiography. She recalled that Wizard of Oz producer Arthur Freed revealed himself to the 11-year-old after a meeting to discuss her playing Dorothy Gale. But I would prefer to agree with FDR and say that the boundless optimism Shirley Temple radiated on screen helps viewers, both then and today, forget our problems for a time.